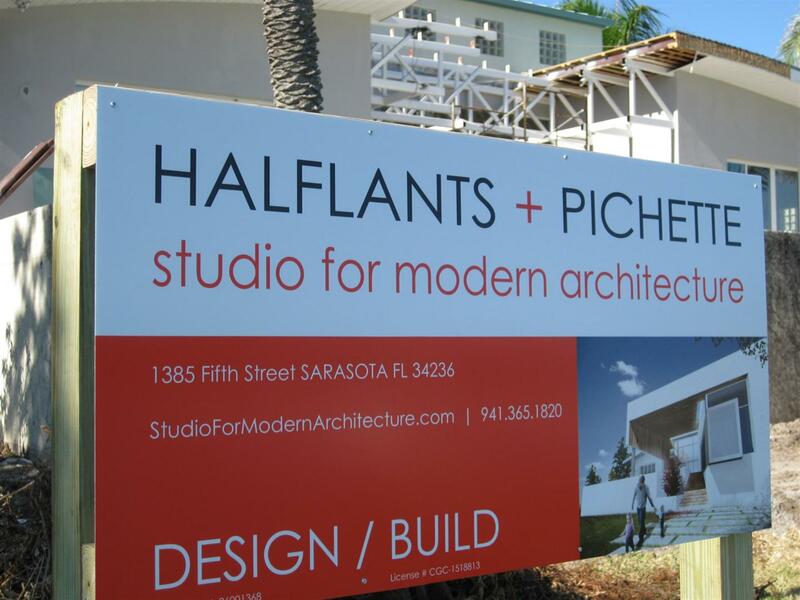 Architect, Michael Halflants, of Halflants + Pichett Architects in Sarasota interviews with Sarasota Visual Art about his work, Sarasota, collaborations, and much more. I regularly lead students abroad and across the country to examine past and recent architectural wonders in such places as Mexico City, Berlin, the Yucatan, Sao Paulo, Rotterdam, Vancouver, or Barcelona. I strive to be a thief of the living architectural history from prehistoric times to more recent decades. A bad architect copies, but a good architect steals. An architectural thief understands the qualities and the essence of past examples and transforms it to make it his own. 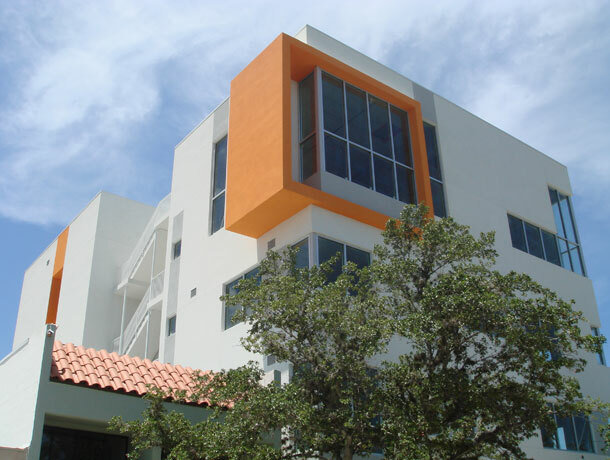 What does it mean to you to be an architect living and working in Sarasota FL? As a Northern European, I relish Sarasota’s climate. As an architect, I try to take full advantage of sub-tropical setting in designing our projects. A few years ago, I started offering a new course at USF called Tropical Design with the aim to better understand how to best build in our climate. We examine the use of materials, key precedents in Brazil and Southeast Asia, and the way a breeze can be directed through a space. One of the greatest services an architect can offer is to help the users gain a sense of place and connect to their surroundings. 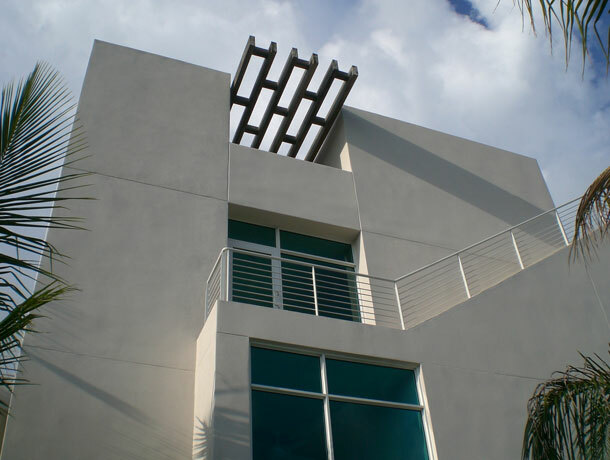 Our designs expand to the outdoor to both add usable square footage and improve the quality of life of the occupants. In our mild climate, a well-designed shaded exterior space can be enjoyed for most the year. What is it about Sarasota that is significant in comparison to other places? Sarasota has a lot to offer. The water, the sky, the mud at low tide, the horizon, the landscape, the orientation to the sunset, and also a rare sense of community that is hard to match elsewhere in Florida. I’ve lived in large metropolitan cities, but Sarasota certainly has its own qualities. I can walk to my office and reach two dozen restaurants. On my way, I may well have a chance encounter with an acquaintance. I live in the Indian Beach neighborhood, a couple hundred yards from a small bay front park. If I take Claire to see the sunset, I know I will also share a conversation with a neighbor. I enjoy the diversity of interest, age, and backgrounds of the community members I meet. Our three colleges all bring experts from diverse fields to the area. My neighbors include illustrators, a mathematician, entrepreneurs, photographers, a guidance counselor, each of them equally passionate about their endeavors. Have you had the opportunity to collaborate with others? If so, can you describe your experience? Architecture is the quintessential collaborative profession. I first work on the design of every project with my business partner, John Pichette. Our clients will have input and make positive contributions. We work with structural, mechanical, acoustical engineers. Their expertise will often help guide the design. During the construction process, craftsmen in their respective trades will make suggestions to improve the details. It’s imperative for us to listen, be inquisitive, and understand that all of the diverse participants can make substantial contributions to better the final design. What is the feeling of having designs become reality? … seeing your buildings? I work for that experience. We opened our office in 2006, just at the start of the recession. As such, we went through many projects that never went beyond the design phase. Often, by the time the project was awarded a permit, the market had changed in such a way that the endeavor no longer made financial sense. In a two year period, we had a run of thirteen aborted projects. We poured our heart into them and burned the midnight oil in the studio only to see them remain as digital files. Accurate renderings, well crafted models, and videos will never match the experience of physically walking through one of our own designs. There are always new viewpoints, surprises, and lessons during construction. To increase the likelihood that our projects actually break ground, John earned his contractor’s license in 2010. We now have four projects that we are building as a design-build firm. The firm holds both licenses to work as general contractors and as architects. While most design-build firms are managed by contractors, we continue to be centered on design. Members of the office are first trained as architects and can bring to the construction their design background and a more holistic perspective. We receive feedback directly from our subcontractors and can make informed aesthetic decisions on the project at all phases of design and construction. What building are you most proud of and why? It’s really hard to pick one, just as it would be cruel to ask you to pick a single painting. Our projects are quite different from one another, but in general the projects I am most excited about are always the ones that I am currently working on. The Nestor Residence in St Petersburg is nearing completion. It will be our firm’s first stand-alone design-build project. 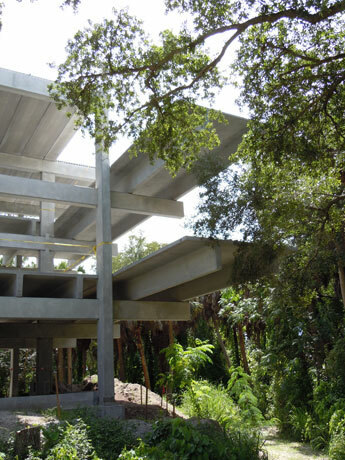 The large residence faces Tampa Bay and is elevated to meet the required flood elevation. On the water side, the roof extends a full 30 feet beyond the conditioned enclosure to create comfortable shaded terraces. The roof is held on one side by a pair of exposed concrete columns aligned with the existing dock. The large overhanging roof folds down on the other side to become a wing wall, shielding a distant power plant from view. The concrete columns, the roof, and the wing wall all taper towards the view. 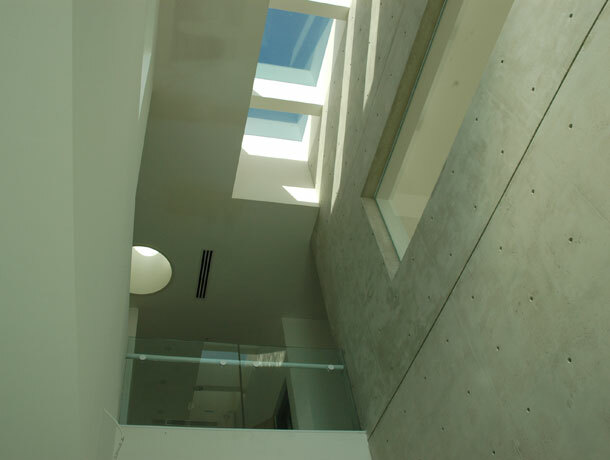 Three linear openings including a long skylight over the double height living space are cut into the roof. They provide framed views of the sky and reinforce the orientation toward the Bay. We are completing a large addition to a residence on St Armands. The existing house was closed off from the view of the Bay. We cut a new 12 foot wide stair into the existing base and created a large outdoor shaded room that doubles the living space. A glass bridge cuts through the house from the foyer to the bay front terrace. We are also starting on designs for residences in Manatee County and Venice and I’m looking forward to developing them further. What are the most important things to take into account when you’re designing a building? Aesthetics, Function? In architecture, you cannot separate aesthetics from function. Without aesthetics, the design is not assuming the potential of its function. Without function, the aesthetics are meaningless. Fifteenth century architect Leon Battista Alberti stated that, for an architect, beauty was in the embodiment of an idea. Beauty cannot be found in proportions or materials alone, but in the conceptual response to a given assignment in built form. The house we are designing in Venice is one lot removed from the Gulf. A very large and unsightly house stands between our lot and the view. Our response was to design a fan shaped house that opens to the view at the corners, to steal glimpses of the Gulf through the setbacks of its better situated neighbors. When built, many will quickly understand the form of the house in relationship to its site and function. Aesthetics and function are two halves of the same shell. Michael Halflants is a principal at Halflants + Pichette Architects in Sarasota and a tenured professor at the University of South Florida’s School of Architecture in Tampa. After studying architecture at the St Lucas Institute in Brussels, he earned a master’s degree in architecture at the University of Florida, where he was awarded the Henry Adams Gold Medal, the department’s highest design honor. He earned a separate degree with concentrations in mathematics and structural engineering. Upon graduation, Michael was first employed as a project designer with the Polshek Partnership in New York. In that capacity, he drew designs for theaters and offices in Manhattan and for the Spencer Museum in Kansas. Working in a joint venture with Arata Isozaki’s Tokyo office, he was on the design team for the Brooklyn Museum addition. Michael strives to maintain deliberately parallel and mutually reinforcing professional creative activities and educational responsibilities. In Tampa, he teaches graduate design studios, the materials’ course, as well as seminars on fabrication, tropical architecture, and modern housing. 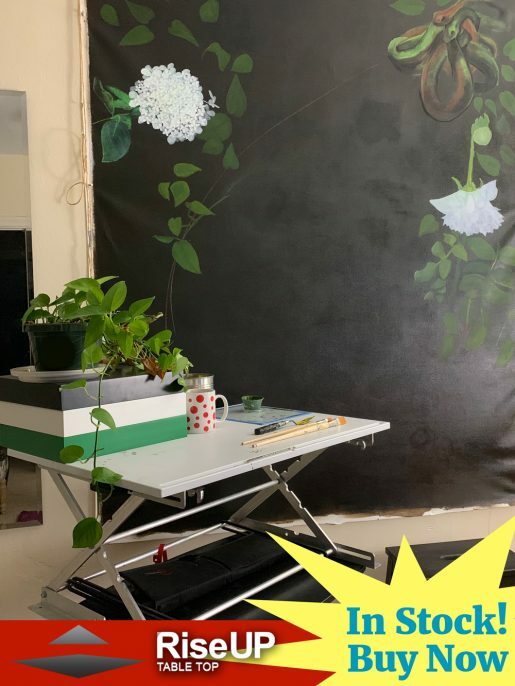 He has regularly presents and publishes papers on the topic of tropical design at international conferences most recently in Bangkok and Jogjakarta. As an architect, Michael received the 2005 AIA Eduardo Garcia Award. In 2006, he cofounded the firm Halflants + Pichette Architects with John Pichette. The following year, the University of Florida honored him with the Young Architect Award. In 2010 alone, the firm was the recipient of eight American Institute of Architects Awards for designs ranging from single family houses to a Korean fellowship hall. 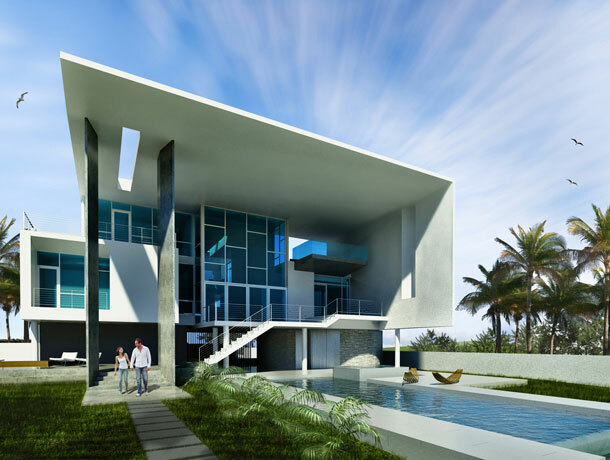 The work of the firm is influenced by international modernism and yet is profoundly rooted in the subtropical setting of South Florida.